For those who may have purchased a Moto device through the Moto Credit program, or anyone thinking of purchasing a new device via this method, letters are going out to inform customers that this will no longer be an option moving forward. 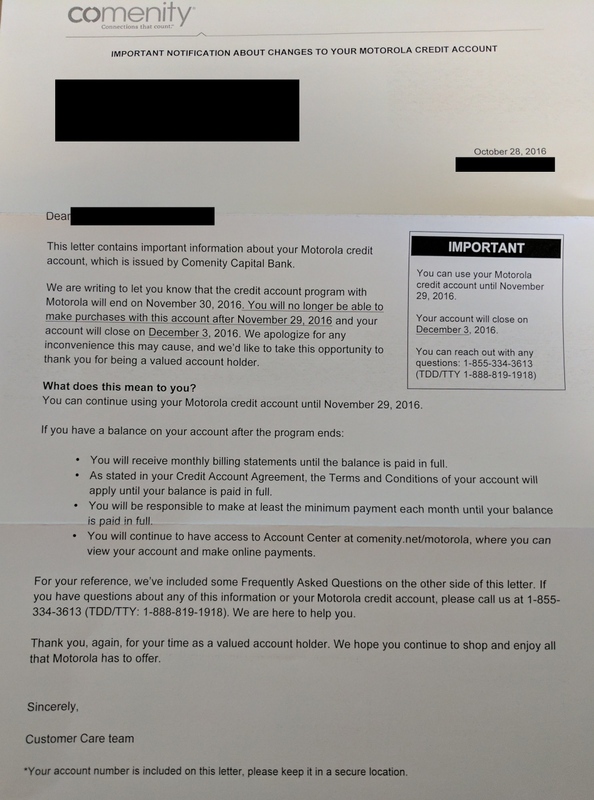 In the letter, which was sent to one of our readers then forwarded to us, Comenity Capital Bank, the bank that issues the credit, states that the credit program with Motorola will cease on November 30, 2016. Furthermore, starting November 29, 2016, no purchases using existing Moto Credit can occur, permanently bringing an end to the program. As of today, no new accounts for purchases can be opened via Moto’s website, which we confirmed with a Moto representative. That means, if you were hoping to purchase a new Moto Z or Moto 360, you will have to do it the old fashioned way, which is either the full retail price or through a carrier for a payment plan. To sum up what’s happening, Moto Credit is no longer accepting applications for credit to purchase a device. However, existing Moto Credit members can still utilize their credit to purchases devices until November 29. After that date, the account will close and no new purchases can be made. As for anyone still making payments on an existing purchase, nothing changes for you. Until your balance is paid in full, you will continue to receive monthly statements, and you will still have access to the Account Center on the Comenity website. Here’s the letter being sent out to existing members.